Earlier this week, I received a wood-framed clock in the mail. It was a promotional tchotchke from the people making Dishonored, the kind of thing a big video game company sends a gaming reporter to make sure they remember their game exists—and perhaps to cultivate some favorable emotions about the game. It is, of course, a bit weird. What does one do with this unrequested clock? It's also unnecessary, because Dishonored needs no clock to help me remember it, and won't need a clock for you to give a damn about it. Dishonored is an ambitious game made by some talented folks in Texas. It's a first-person game that you can play as an action blockbuster or as a stealth adventure. It might remind you of some other very good games, but it has lots of distinct flair. The prevailing fantasy in this game is to be a "supernatural assassin". So picture a first-person game in which you might emit magical powers with your left hand, slit throats with your right, while jumping/warping from rooftop to rooftop and then possessing the person next to the guy you've been assigned to kill. The game is set in a beautiful, strange city called Dunwall, which had its look designed by Viktor Antonov and Sebastien Mitton, the former being the artist who conceived the look of Half-Life 2's City 17. They're going for a mid 1850s America look mixed with Victorian England. Dash in a bit of whaling town, and don't call it Steampunk, because it's not exactly that. There will be no rivets or brass in this game, Antonov mentioned, at least as a general goal. There's also no clear sense of day or night, because they want players to feel more of a dreamlike mood where it could always be sort of either time. You may peek through any door that has a keyhole as you skulk through the game, which tells you plenty about the level of technology in this game's world and the game developers' interest in letting you snoop. The main level we were shown was set in the Golden Cat Bathhouse, which, you can imagine, would have some secrets on the other side of its keyholes. You can possess a fish, thanks to the game giving you the power to possess any living thing, including the people you're trying to save, the people you're trying to kill or even the rats scurrying at their feet. This is one thing that qualifies you as a "supernatural assassin." If you possess a rat, a guard might step on you. Just know that you can't possess anything or anyone forever; only for a few seconds. This is a linear game with more powers than you can get in one playthrough. It's a game that will have you acquiring special powers, attaining more potent versions of them, accruing weapons. Basically, you're building your own arsenal that suits your strategy and the whole point of the developers showing me the same level twice was to show how differently you could handle it, depending on your abilities and interests. In this game, there are lots of ways to do the same thing.Take the Bathhouse building I saw during the demo. It's where the action was going to be. And while we could possess a fish to go inside, there were supposedly seven other ways to get in there, too. One of your best powers is called Blink. It lets you scoot forward a few yards in space, like a short-distance warp. Combine this with agile jumping and you can dart not just across rooftops but through open space, suddenly appearing in a crowd or getting to the other side of an open doorway without ever walking past it. One of the powers they didn't mean to give players, but did involves free-falling from the top of a building but then possessing a guard before you smack into the ground. The designers said that their test players figured it out and it seemed too terrific to remove. So, yeah, kill a guy on a balcony, and then jump off the balcony before his bodyguards can seize you, drop a few stories but body-hop into a regular citizen who is walking down the street in the nick of time. You can see where your enemies see if you activate a special power that causes their vision cones to be visibly emitted from their eyes. If they see you, trouble. If they see a painting on a wall, they might comment about it. If you have to compare this to another game, think more Deus Ex than BioShock. Co-creative director Smith waved off my guess that all these player powers mixed with combat might make BioShock the closest apt comparison to Dishonored. No, think more of the Deus Ex games, he said (and, hey, he was one of the main creators on the first two, so it all makes sense). The difference? As far as I can tell, while both games offer the players lots of choices, Dishonored offers a wider range of them and is more explicitly designed to let you play in stealth. And with your right hand you will kill, because that's the hand that will wield the games guns and blades. The first person melee combat you'll do with the knife got me wondering about another comparison, to Colantonio's former project Dark Messiah: Might & Magic but he said that game's focus on first-person melee is not exactly replicated here. There will be a block and counter system in Dishonored, but not one with Dark Messiah's depth. Two corrupt aristocrats needed killing in the level I was shown. These brothers, the Pendleton Twins, are two of the many scumbag aristocrats who are keeping the people of Dunwall down while trying to avoid whatever mysterious illness is now plaguing the lower classes. You, by the way, are Corvo Attano, former bodyguard of the Empress, wrongly accused of her murder. You can dispose of your targets in many ways, some of them fatal, some of them wickedly clever. Imagine, say, you discover one Pendleton Twin in a room with a prostitute. You may walk in and shoot him or knife him or summon a pack of rats to eat him (and possess one of those rats while you're at it). But you also could have never entered the room and just locked it, turned up the steam in his room and boiled him alive. But why not just help out a local crime boss by breaking into the Bathhouse and finding the combination to a safe he wants access to. Give him the combo and he'll take care of the Pendletons by shaving their heads and sending them to work in the mines they ruthlessly run. You know, you don't have to give the crime boss the combo before you go open that safe yourself and take what's in it. This game is supposed to be open to any branch you can imagine taking. You're expected to experiment. You could go through the game without killing anyone, but then you'd never have approached the second Pendleton twin, poisoned him, possessed him, walked him over to the balcony, jumped out of his body (yours appears when you do this), pushed him over the edge and then bailed. The world will adapt to you, Smith told me, saying that you might hear different conversations or see more guards or even witness entirely different scenes of squalor or hope depending on how brutally you're playing. He refrained from describing any pat formula, so I couldn't tell if playing without killing, for example, equals seeing more cheerful things. It seems like they're going for something subtler than that. We'll have to see how that plays out. The walkers you'll remember seeing are called Tallboys. They appeared in a more action-heavy sequence that took place in an area called The Flooded District. There are men in those powerful walkers and, yes, you can possess them. Dishonored showed well. Its world is vivid and interesting and it does appear to offer a good range of play styles that will let players figure out just how bloody they want their revenge quest to be. All games are best judged when you play them yourselves, doubly so for malleable games like this that are pitched as letting you dabble and push at its seams to see what's possible. This is the kind of game that entices you to try and break it. Say, let's see what happens if I try to kill this guy this way or try to finish this level as a rat! This, therefore, is the kind of game it's easy to get excited about. No clocks necessary, though I should mention who sent the timepiece. Arkane is owned by Bethesda/Zenimax, the Skyrim people. They know how to push games, so you're going to be hearing a lot more about this one—with good reason. 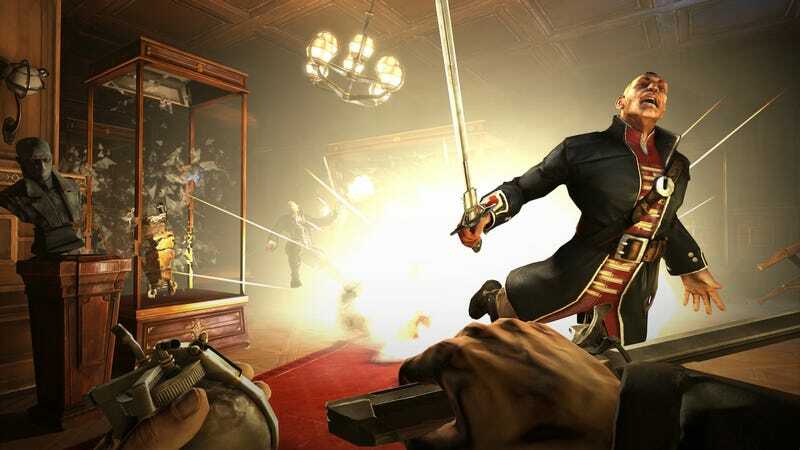 Dishonored will be out later this year for PlayStation 3, Xbox 360 and PC.